[14 November 2011] -- With the world facing an unprecedented urban expansion, failure to incorporate urban priorities into the global development agenda carries serious implications for human security, global security and environmental sustainability. A new publication titled Reducing Urban Poverty: A New Generation of Ideas highlights the research and innovative thinking of the next generation of urban planners, practitioners and policymakers. The book, edited by Lauren Herzer, comprises the winning essays from the second annual academic paper competition co-sponsored by the Cities Alliance, the Woodrow Wilson Center’s Comparative Urban Studies Project (CUSP), USAID’s Urban Programs Team, the International Housing Coalition, and the World Bank. Launched in 2009, the paper competition aims to bring fresh perspectives to the dialogue on urban issues within the academic and policy worlds. It also seeks to generate innovative strategies to reduce global urban poverty. 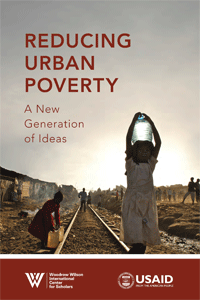 For 2011, “Reducing Urban Poverty” was chosen as the theme. Each student author focused on one of three topics: Land Markets and Security of Tenure, Health, and Livelihoods. A panel of urban experts representing the sponsoring institutions reviewed 70 submitted abstracts, from which 16 were invited to write full length papers. Of these, six were selected for this publication.